With on-demand freelance technicians, maintain & fix any problems related to computer systems. Every company in the world needs a computer repair technician. They’re the ones who will maintain your computer systems and fix any problems that occur. At Field Engineer, we connect companies to freelance engineers via our revolutionary platform. You can find the best freelance computer repair technician around, and you barely have to do a thing! Our marketplace is simple; it matches you with the best on-demand field engineers for any job you desire. We have over 40,000 registered engineers on our platform, and they span across over 180 countries. 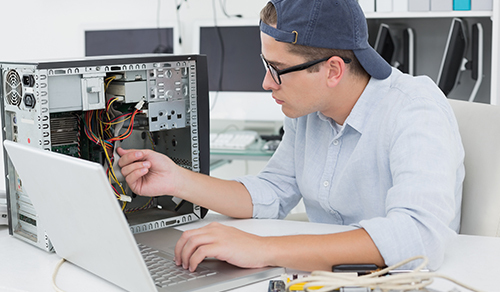 When you post a job, we send it to all the freelance computer repair technicians that meet your specific requirements. As a result, you can hire someone with a wealth of experience, at a fraction of the cost of bringing in a full-time employee. You only pay them for the work they carry out, and it’s so easy to track and manage everything they do. We slash the costs of hiring employees for your business by offering our on-demand freelance platform. Don’t bother paying for job adverts, an HR team to conduct interviews, background checks, and so on. We’ve already vetted every engineer on our site, so they’ve been pre-screened and are ready for action. Don’t waste time waiting around for applications to come in - you’ll get dozens within moments of your job going live on Field Engineer! This gives you more time and money to put back into your business, helping it grow. It’s simple; sign-up to Field Engineer today, and you can post your first job immediately. Then, we’ll connect you with the best in the business, allowing you to hire a worthy candidate that will more than impress.